Blended learning provides the flexibility to accommodate the varied requirements of pedagogies, disciplines and levels of course, together with the needs of a wide variety of learners. However, anyone concerned with the integration of online tutoring to support students appropriately may need to reassess current practice. This book adopts a pragmatic and common-sense approach to blended learning by situating the use of online media within a well-grounded teaching and learning strategy. It provides practical ideas for the successful implementation of blended strategies, including good practice in both asynchronous and synchronous tutoring, appropriate assessment design for developing successful blended learners, and innovative approaches to professional development for distance tutors. It is illustrated with a wide variety of examples and comments from students and practitioners in both distance and campus-based environments in 13 different countries. Since the first edition was published in 2006, there has been great interest in Web 2.0 technologies and their potential for use in an educational environment. 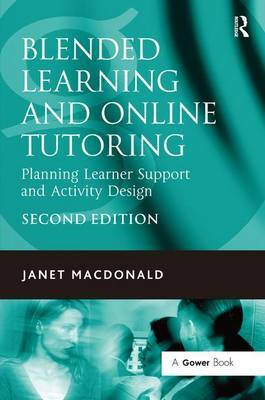 This second edition has therefore incorporated many new examples of good practice, making use of a combination of tried and tested tools as well as blogs and wikis for supporting students. There has also been a recent rise in the use of activity-based learning and interest in its potential for supporting students in distance and online environments. The new edition incorporates many new exemplars of learning activity design in Part Three, to illustrate approaches to the development of critical, independent learners.